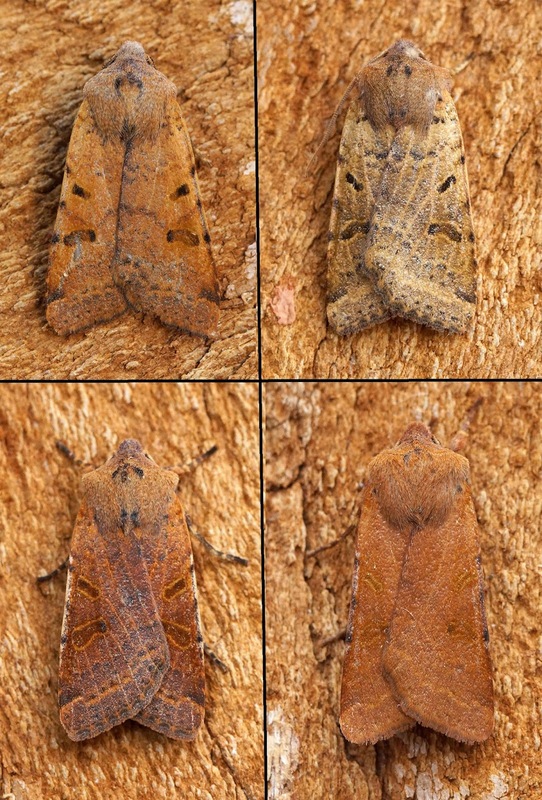 Here are all of the highlights from mid to the end of September in my garden to my 125w MV Robinson Trap. Garden species count for 2018 now upto 518. Donacaula forficella - 02/09/18 - Missed from previous posts, not common and my third garden record so really welcome. I use to pick this species up commonly at wetland reserves where the habitat is more suitable. Brindled Green - 15/09/18 - An absoloute beauty of a Brindled Green greeted me on Sunday morning, box fresh and worthy of a few photographs. I also caught a few more in the weeks following, some were rather grey in appearance in contrast. Swallow-tailed Moth - 17/09/18 - This record at the time of recording was a very late record for me, my latest in fact, but since there have been many many more people recording late moths this year, more than ever before! Or are there more people suddenly recording moths these days with the advent of social media? Who knows. Beaded Chestnut - 17/09/18 - A regular species here in my garden, and many different forms were recorded over the following weeks of which I took pleasure of photographing. Deep-brown Dart - 17/09/18 - Never common here with just 4 previous records, in fact..2018 was the best year for it with 3 records alone. Spruce Carpet - 17/09/18 - A season first, generally I record these in the Spring as well as the Autumn, slightly more regular than Gre-pine here. Still waiting for Pine mind! Treble Brown Spot - 18/09/18 - My latest record of this species by a week exactly, nice and fresh as well and surely a 3rd brooder having recorded these in early June and again in August. Diplodoma laichartingella - 18/09/18 - Second garden record and a larval record this rime after trapping the adult last year in June. Scarce here in Herts so very pleasing indeed. Brick - 19/09/18 - Getting fairly common here in my garden and a moth that is maybe on the increase? A few years back it appeared to almost disappear even in prime habitat. Dark Chestnut 19/09/18 - I like Dark Chestnut, it's an unusual dark looking moth with a real shine to it's wings. Most often encountered in the Autumn with just one record in the Spring here in 6 years. Grey-pine Carpet - 19/09/18 - Another moth that appears in Spring after emerging in Autumn and over-wintering, never as common as Spruce so very welcome. Large Ranunculus - 22/09/18 - Is Mr consistent here in my garden, always appearing between the 18th and 22nd of September since 2012 and flying for just 2 weeks usually, i've had upto 5 in one night before, this year they weren't as common unfortunately...just two made it to my trap. Green-brindled Crescent - 25/09/18 - Another good looking moth and one that has a metallic green form and a darker brown form, common here in my garden. Merveille du Jour - 25/09/18 - Probably the best looking moth here in the UK I reckon and an annual visitor to my trap here. I'm lucky to have mature Oaks at the end of my garden along the bridleway so I always get these in good numbers. Mallow - 26/09/18 - Quite a unique species this, broad-winged and with a lovely pattern across it's wings. An annual visitor here, usually one per year. Pandemis corylana & Pandemis cerasana - 26/09/18 - Both very late records, cerasana even later than corylana as this is a June moth here, it's rare to record both of these species as 2nd broods for me. Caloptilia semifascia - 26/09/18 - Recorded in April earlier on in the year, it was nice to get a seasonal record of this species. Common Marbled Carpet - 27/09/18 - A third brood of this species again isn't common here, but it was the same story across a lot of the Country with really late records that were still being reported in the first week of November! Ruby Tiger - 27/09/18 - My latest record of Ruby Tiger by 23 days! I've recorded the Caterpillars at the end of September before, they always seem to get attracted to the MV light strangely. This adult though was in beautiful condition. I get them infrequently here in the garden, single-brooded in July. My earliest record ever was on the 12th of March! 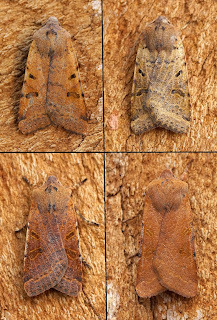 In fact I have two March records and interestingly both were found flying on a warm sunny afternoon. Cydalima perspectalis - 27/09/18 - Third garden record of this adventive pest species (with 2 records last year). 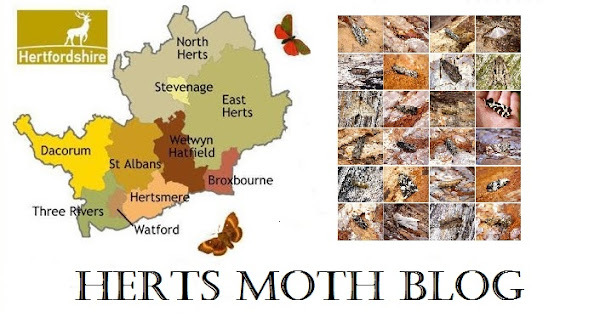 It's certainly on the increase and spreading like Oak Processionary and Jersey Tiger are from the Thames Estuary and areas such as Richmond Park in central London. Another 3 more records were added at the start of October taking my garden total to 6. Yellow-line Quaker - 29/09/18 - The first of the two common Autumnal Quaker's turns up bang on time, fairly common and were still hanging on a week ago here.